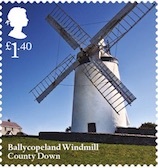 Somewhat later than I would have liked the website has now been updated with a page showing the new stamps to be issued tomorrow (20 June), a thematic set of Windmills and Watermills. 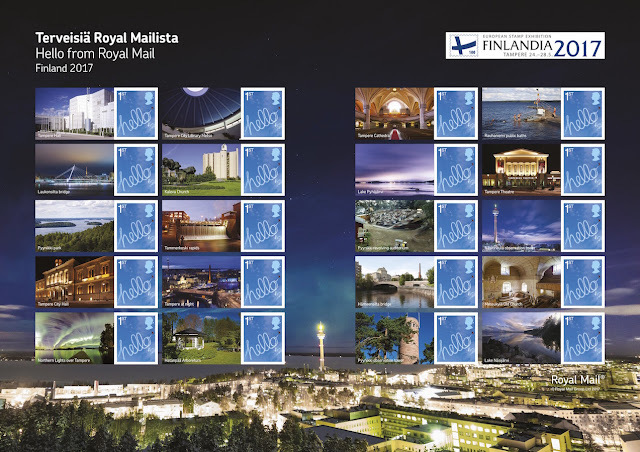 Two more pages with the Landmark Buildings (13 July) and World War I (31 July) stamps have also been added. This (generic smilers-style) sheet marking the FIP exhibition in Tampere is in the normal format of 20 x 1st class 'Hello' stamps with 20 labels depicting scenes from, in this case, Finland. The sheet was printed as usual by International Security Printers (Cartor) in litho, and sold for £13.50. The exhibition ran from 24-28 May. 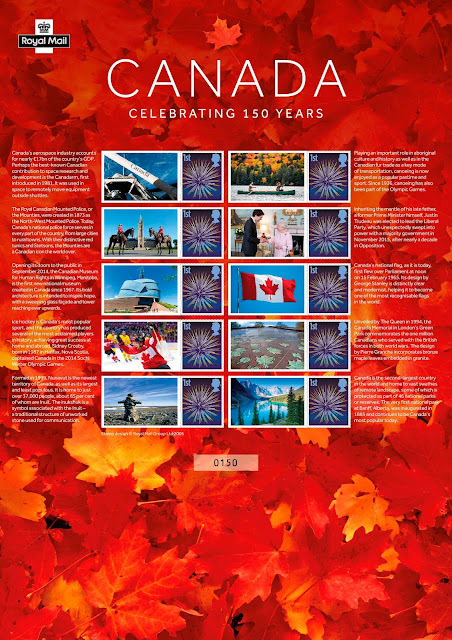 (Click on the heading link for more information - click on the image to see it in a larger size). Princess Royal is a style customarily (but not automatically) awarded by the Monarch to their eldest daughter. Holders retain the style for life, so a princess cannot receive the style during the lifetime of another Princess Royal. 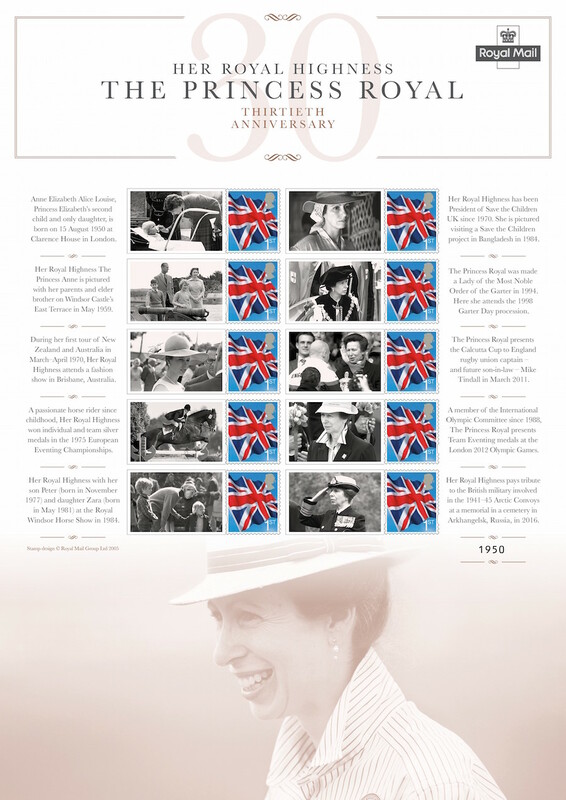 Princess Anne was awarded the title in 1987 and this sheet commemorates 30 years since becoming the Princess Royal. Coincidentally on the day this sheet was issued, Princess Anne opened the new Postal Museum and had a tour of the Post Office Underground Railway. 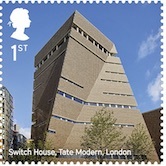 The Museum opens to the public on 28 July, and a commemorative sheet marking the new museum will be issued on 13 September at Stampex. Containing 10 Union Flag stamps and attached illustrated labels, this sheet was sold for £14.95 (Royal Mail product code AV043). No technical details have been provided but we suppose that like all similar sheets this has been printed in lithography by Cartor ISP. 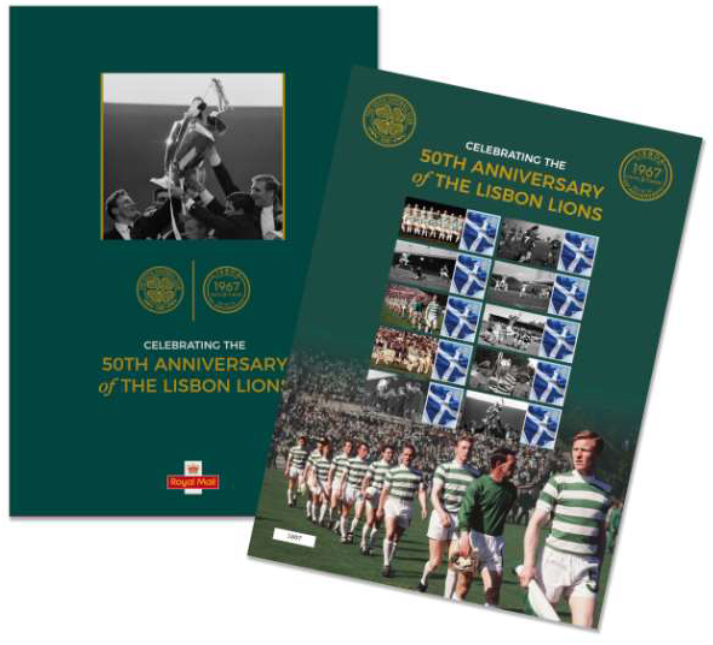 "Consistent with our strategy to take Stamp based collectibles to other fan bases, Royal Mail has teamed up with Celtic to launch a Special Stamp Sheet and presentation folder celebrating the legendary Lisbon Lions – on the 50th anniversary of the first British European Champions. "Celtic were the first British Football Club to win the European Cup / Champions League, beating Inter Milan 2-1 in the final on 25th May 1967 at the Estádio Nacional near Lisbon, Portugal. The sheet features the Saltire Scottish Definitive and is a limited edition of 5000, which will be sold predominantly by the football club through their nine retail outlets and online. A small quantity will be available from Tallents House priced at £19.95 code VA293"
Printed by ISP in litho, self-adhesive with stamps perforated 15 x 14. * This is not listed on Royal Mail's website. 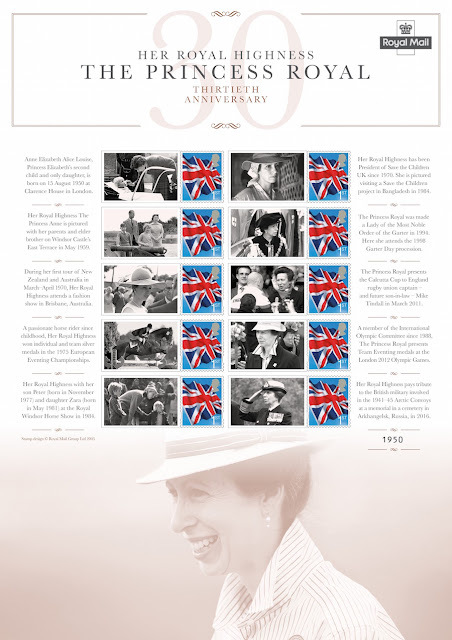 The date of issue is shown in the June Philatelic Bulletin as 25 May, but we had an email from Royal Mail on 26 May stating that it was embargoed until further notice. According to the June Philatelic Bulletin this sheet will contain 10 x Firework (definitive-sized greetings) stamps and attached labels, and be in the usual vertical format. The design has not yet been released by Royal mail but will be added here next week. 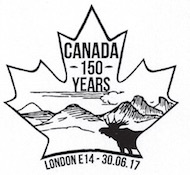 One special postmark has already been announced. 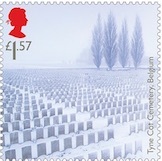 Update 13 July: the design has been revealed and the sheet is available for £15.95 on Royal Mail's Stamps website. Click on the sheet for a larger image to see the labels and text.